To Cite: Pusiol T , Doriana M, G. Zorzi M, Piscioli F. Pigmented Epithelioid Melanocytoma in a Child: Unusual Clinical Presentation, Iran J Pediatr. 2013 ; 23(3):369-370. Zembowicz et al coined the term PEM for a “low-grade melanocytic tumor with metastatic potential indistinguishable from animal-type melanoma and epithelioid blue nevus”. PEM is a distinct melanocytic tumor occurring in a sporadic setting and in the context of Carney complex. A 10 year-old child was referred for evaluation of a blue-black cutaneous macule found in the right pectoral region. The lesion measured 0.4×0.3 cm. 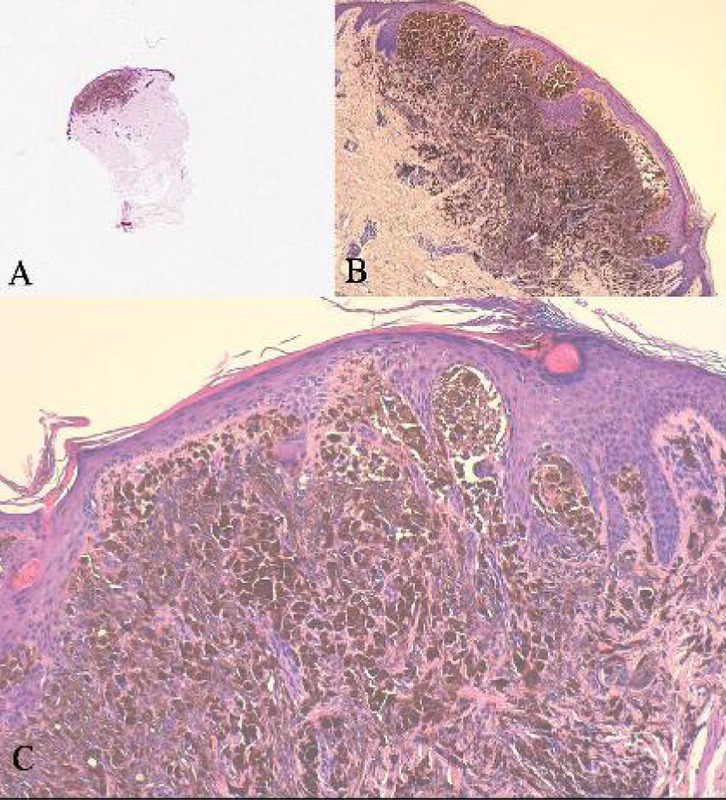 The histology of the lesion showed a densely pigmented dermal nodule with infiltrative borders. The proliferation was composed of epithelioid and spindle melanocytes with heavy pigmentation; atypical cells were present (Fig. 1). Immunohistochemically, the epithelioid cells showed strong positivity for Melan-A and HMB-45, and relatively weak positive straining for S100. Lesions of the Carney complex were not found. Sentinel lymph node biopsy was not performed. The patient remains well with no evidence of local recurrence, lymph node metastasis or distant metastasis 2 years post-excision. The published studies about PEM[1-2] do not report the size of the lesion. Moreover, in the original study published by Zembowicz et al the number of children and adolescents and the size of the 41 lesions are not specified. In our case the very small size is an unusual clinical feature that could underestimate the lesion. Melanocytic tumors with indeterminate biologic or uncertain malignant potential (MelTUMP) include lesions that do not display the entire characteristic that permits a diagnosis of vertical growth phase melanoma and whose capacity to metastasize are indeterminate or uncertain. Berk et al study considered seven cases of MelTUMP, including five lesions with spitzoid differentiation (epithelioid and spindle morphology) and two PEMs. Microscopic involvement of regional sentinel lymph nodes was present in 2/6 (33%) of MelTUMPs. B: Lesional cells infiltrate well into the reticular dermis with a poorly circumscribed infiltrative pattern at the base (H & E, 40×). C: Densely and heavily pigmented spindle to epithelioid melanocytes admixed with melanophages (H & E, 100×). Metastasis is compatible with PEM because, for definition, it is considered a low-grade malignant lesion, potentially capable of metastasizing. The presence of metastasis is a conclusive finding for malignancy. When a tumor is histologically defined as to have “uncertain malignant potential”, the development of metastasis shows that the diagnosis has been erroneous. When a “MelTUMP” is associated with regional lymph node metastases, Elder and Xu  report the lesion as “metastatic MelTUMP” and indicate that “the biological potential of this metastatic tumour remains uncertain”. These considerations are not acceptable because the metastasis is the clinical manifestation of biological malignancy. The considerations of Berk et al. add confusion to the understanding of the MelTUMPs course in children and adolescents. PEM is distinct melanocytic entity that exhibits a low-grade malignant behavior in the form of both regional and occasional nonregional metastases, but rarely cause death. Wide local excision with clear surgical margins is recommended. Prognostic implications of sentinel lymph node positivity remain to be established. As has already been shown for the other melanocytic neoplasms, fluorescence in situ hybridization could be useful for a better assessment of the malignant/metastatic potential of PEM. Studies of large numbers of cases of PEM with long-term follow-up are necessary in order to determine the impact of individual clinico-pathological features on the biological behavior of these tumors in children and adolescents.